Powerful long range unit, unable to move and attack in the same turn. Critical hit at max range. Trebuchets are ranged vehicle ground units which cannot capture buildings. They're available to recruit from a Barracks for 900 gold. Although they cannot capture structures, they can attack any units inside their range without moving, provided they haven't moved the same turn. Trebuchet Cherrystone Kingdom Being a weapon primarily of siege warfare, it has been many centuries since Cherrystone has had any need of the Trebuchet. In fact, at the time of writing, there are only 6 remaining in commission, their wood creaking and their ropes weary. Despite this, the knowledge of their construction has been carefully preserved, and soldiers are trained in Trebuchet as a matter of course. Trebuchet Felheim Legion The Trebuchet is a recent addition to the legion, reflecting the degree to which Valder has brought structure and organisation to Felheim. Though its operators are unpractised and unruly, it has proved an effective addition to Felheim's armies. Trebuchet Heavensong Empire Heavensong's Trebuchets launch projectiles made up of a brittle eggshell-like casing, usually filled with potent gunpowder. These projectiles explode on impact, with devastating effect. On occasion, Commanders have seen fit to fill the shells with alternative payoads, ranging from caltrops to flaming pitch, and on one unusual occasion, cabbages. Treebuchet Floran Tribes It is constructed almost entirely from living wood taken from the Great Tree at the centre of the Gloomwoods. The Treebuchet is considered to be alive, and as such, is treated with great respect by the Floran. In fact, technically, it outranks those who operate it. 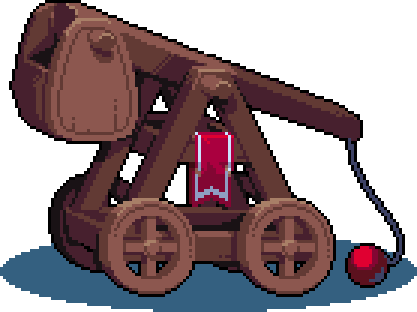 A Trebuchet will perform a critical hit when attacking a unit at a distance of at least 5 tiles. During severe weather, a Trebuchet cannot score critical hits, as its range is reduced to 4 tiles. During favorable wind, a Trebuchet can score its critical hit at a range of either 5 or 6 tiles. Like most unit types, the Trebuchet's critial hit deals ×1.5 damage. In other words, this hit deals 50% more damage than a regular attack would.